An ogre (feminine: ogress) is a large, cruel, monstrous and hideous humanoid monster, featured in mythology, folklore and fiction. Ogres are often depicted in fairy tales and folklore as feeding on human beings, and have appeared in many classic works of literature. 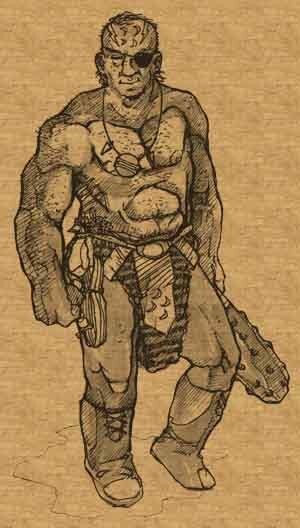 In art, ogres are often depicted with a large head, abundant hair and beard, a voracious appetite, and a strong body. The term is often applied in a metaphorical sense to disgusting persons who exploit, brutalize or devour their victims. Closely related is the troll figure, although these are sometimes not as malevolent. The word ogre came into wider usage in the works of Charles Perrault (1628-1703) or Marie-Catherine Jumelle de Berneville, Comtesse d' Aulnoy (1650-1705), both of whom were French authors. Other sources say that the name is derived from the word Hongrois, which means Hungarian. The word ogre is thought to have been popularized by the works of Italian author Giambattista Basile (1575-1632), who used the Neapolitan word uerco, or in standard Italian, orco. This word is documented in earlier Italian works (Fazio degli Uberti, XIV cent. ; Luigi Pulci, XV; Ludovico Ariosto, XV-XVI) and has even older cognates with the Latin orcus and the Old English orcneas found in Beowulf lines 112-113. All these words may derive from a shared Indo-European mythological concept (as Tolkien himself speculated, as cited by Tom Shippey, The Road to Middle-earth, 45). Some see the French myth of the ogre as being inspired by the real-life crimes of Gilles de Rais. The first appearance of the word ogre in Perrault's work occurred in his Histoires ou Contes du temps Passé (1697). It later appeared in several of his other fairy tales, many of which were based on the Neapolitan tales of Basile. The first example of a female ogre being referred to as an ogress is found in his version of Sleeping Beauty, where it is spelled ogresse. The Comtesse d' Aulnoy first employed the word ogre in her story L'Orangier et l' Abeille (1698), and was the first to use the word ogree to refer to the creature's offspring.